Golden Spoon deserves a second try and I'm glad I went back. We wanted to continue our girl bonding session tonight and after a light yet delicious meal at Cibo, we walked over to Golden Spoon which is actually being operated by the same company where we all met and became such great friends. Taking the advice of a friend who loves Golden Spoon, I got the Cake Batter flavor (Php. 115/small cup) and added in two toppings: crushed graham crackers and mochi (Php. 30/topping). First bite, I liked the sweet vanilla flavor that has a buttery addition just like a rich cake batter that kids love to lick off from their mom's spatula. I was happy with my choice of toppings and I felt that getting a small cup was just right for me. No queasy feeling this time. 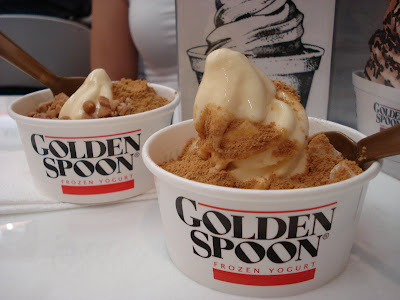 Golden Spoon is located at the Ground Floor of the Shangri-la Mall (right beside Starbucks Coffee). Looks tempting! And it's (relatively) healthy too! I like eating strawberry but there's something about strawberry flavored food that doesn't always taste good. Fran! Thank you for calling it "the ice cream lover's yogurt"! I don't really like fro-yo because it's sour and I much prefer ice cream, but because of your post, I'm now willing to try Golden Spoon!